Indian Premier League IPL 2019 Free Internet Packs for BSNL Prepaid mobile customers to watch uninterrupted T-20 Cricket league matches on mobile device under GSM mobile services. High speed 4G Internet service providers Bharat Sanchar Nigam Limited (BSNL) has announced two new mobile data packs of Rs.199 and Rs.499 offering unlimited features for prepaid subscribers to view Live IPL T 20 season 2019 matches as well send SMS and subscriber to set free Cricket personal ring back tone etc., played across India. 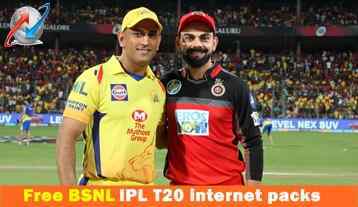 As per BSNL website information in support to T-20 League matches bsnl has decided to launch two new data usage packs for prepaid mobile users to watch and support favorite IPL teams and favorite players under season IPL 2019. Indian Premier League website already displayed its IPL Schedule time table and Status of Live cricket matches Point wise IPL chart table for cricket lovers. New internet pack of Rs.199 offers, Unlimited Local/STD voice calls (On-net/Off-net) within the circle with 1GB data usage per day. Subscribers can also set their favorite cricket team PRBT along with Cricket SMS alert. In addition this pack also provides Unlimited PRBT song change benefit which comes with 28 days validity under Prepaid mobile services. Another internet usage pack of Rs.499 offers, Unlimited Local/STD voice calls (On-net/Off-net) within the circle and National Roaming including Delhi/Mumbai areas feature with 1GB data usage per day and Free 100 SMS per day. Subscribers can also set their favorite cricket team PRBT along with Cricket SMS alert. In addition this pack also provides Unlimited PRBT song change benefit which comes with 90 days validity under Prepaid mobile services. BSNL Telecom circles according to the technical feasibility and availability of denomination in their circle can change pack MRP in multiple of Rs.10/- with the condition adjustment of amount from PRBT component and not from BSNL STV component. The above 2019 IPL T-20 Internet packs will be available immediately during the IPL season in all telecom circles following terms and conditions. The list of teams participating in the season 2019 Indian Premier League played across India are Chennai Super Kings, Delhi Capitals, Kings XI Punjab, Kolkata Knight Riders, Mumbai Indians, Rajasthan Royals, Royal Challengers Bangalore, Sunrisers Hyderabad.